Picture is for reference only and may contain options or accessories that are not included. Welcome To Our Listing! 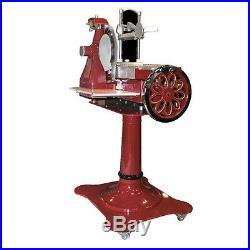 Globe, FS14, Manual Traditional Flywheel Slicer W/ 14 Chrome-Plated Steel Blade. The Globe FS14 is a manual traditional flywheel slicer with 14 chrome-plated carbon steel blade & built-in sharpener. This unit cuts at 9 thickness and is adjustable up to 2.55mm. This unit features blade protection ring, marble receiving shelf, aluminum construction with stainless steel trim, baked enamel paint, and gold & black detailing. Traditional 14 (350mm) diameter hollow ground chrome-plated carbon steel precision knife. Accommodates oversized product up to 11″ wide and 9.5″ high. Fully hand-operated, no electrical connection required. Largest low-resistance flywheel for superior speed control and easy operation. Designed for ease of cleaning; meets demanding sanitation certification requirements. Ring guard for blade protection. Precision slice adjustment with 9 settings from tissue-thin up to 3/32 (2.5mm). Aluminum construction with stainless steel trim. Baked enamel paint and premium decorative gold detailing. Authentic Italian marble receiving shelf. Most warranties are not valid if used at a non-commercial address. WARNING: This product may contain chemicals which are known to the state of California to cause cancer, birth defects or other reproductive harm. These items are delivered to your locations via a tractor trailer. You are responsible for offloading the merchandise and bringing your merchandise inside of your location. What is a lift-gate? A lift-gate is a device used to raise and lower items from ground level to the level of a tractor trailer. These trailers are designed to load and unload at a loading dock or with a fork-lift. Usually this is a home, but it could be a church, farm community center, etc. Businesses run from a home are still considered residential. When you receive the item and sign for it, you own it. This is the only way you will be compensated for the damage! Inspect the outside of the packaging to look for dents or crushed corners. If you see anything even slightly suspicious carefully remove all packaging and inspect the item. The driver may be impatient but that beats having to settle for a damaged item. What if my item is damaged? You have two options. This is often the best option if you need to get your item operational and the damage is cosmetic. If accepted, prior authorization must be obtained to return any equipment. Refurbishing, if necessary, will be an additional charge to purchaser and will be deducted from any authorized credit. The item “Globe FS14 Manual Traditional Flywheel Slicer With 14 Chrome-Plated Steel Blade” is in sale since Friday, August 4, 2017. This item is in the category “Business & Industrial\Restaurant & Food Service\Commercial Kitchen Equipment\Food Preparation Equipment\Other Commercial Food Prep”. The seller is “dougequip” and is located in Bluefield, West Virginia. This item can be shipped to United States. Picture is for reference only and may contain options or accessories that are not included. Welcome To Our Listing! You are looking at the: Globe Chefmate Series Gas Hot Plate. 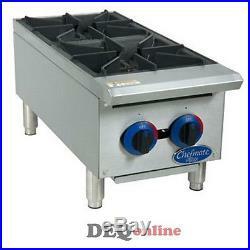 The C12HT is a Globe Chefmate Series Hot Plate. It is made with stainless steel construction and an extended cool-to-touch front edge. The heavy-duty cast iron grates maximize heat distribution. With 25,000 BTUs per burner, this unit has a high-performance factor. The pilots are adjustable and have front access. The stainless steel legs come with adjustable non-skid feet. Available in 12” (2-burner) and 24” (4-burner) widths. Stainless steel construction and extended cool-to-touch front edge. Heavy-duty cast iron grates for maximum heat distribution. High performance 25,000 BTUs per burner. Adjustable pilots with front access. Stainless steel legs with adjustable non-skid feet. Unit ships Natural Gas with LP conversion kit included. Stainless Steel Full-Length Catch Tray. Number of Burners: 2. 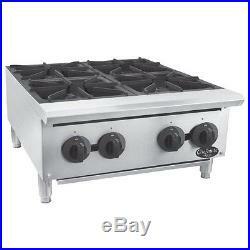 Cooking Area Per Burner: 12″ x 12″. BTUs Per Burner: 25,000. Total BTUs: 50,000. Foot Print: 21.25″ x 11.5″. Product Dimensions: 33″ L x 12″ W x 13.25 H. Most warranties are not valid if used at a non-commercial address. WARNING: This product may contain chemicals which are known to the state of California to cause cancer, birth defects or other reproductive harm. These items are delivered to your locations via a tractor trailer. You are responsible for offloading the merchandise and bringing your merchandise inside of your location. What is a lift-gate? A lift-gate is a device used to raise and lower items from ground level to the level of a tractor trailer. These trailers are designed to load and unload at a loading dock or with a fork-lift. Usually this is a home, but it could be a church, farm community center, etc. Businesses run from a home are still considered residential. When you receive the item and sign for it, you own it. This is the only way you will be compensated for the damage! Inspect the outside of the packaging to look for dents or crushed corners. If you see anything even slightly suspicious carefully remove all packaging and inspect the item. The driver may be impatient but that beats having to settle for a damaged item. What if my item is damaged? You have two options. This is often the best option if you need to get your item operational and the damage is cosmetic. If accepted, prior authorization must be obtained to return any equipment. Refurbishing, if necessary, will be an additional charge to purchaser and will be deducted from any authorized credit. The item “Globe C12HT Chefmate Series Gas Hot Plate 50,000 BTU” is in sale since Tuesday, January 12, 2016. This item is in the category “Business & Industrial\Restaurant & Food Service\Commercial Kitchen Equipment\Cooking & Warming Equipment\Ovens & Ranges\Ranges”. The seller is “dougequip” and is located in Bluefield, West Virginia. This item can be shipped to United States. Mouseover image to zoom. Cook a variety of your most popular entrees and sides with the Globe C24HT Chefmate 24 gas hot plate! This hot plate features 100,000 BTUs of power among four burners to give you the cooking heat you require to produce high quality food. Its adjustable pilot lights make it easy to change temperature, while the heavy-duty cast iron grates evenly distribute heat. The exterior is made of stainless steel for long-lasting durability, and for stability, the whole unit is mounted on stainless steel legs with adjustable non-skid feet. Our facility is located in NJ. Item must be in NEW and UNUSED condition. Once the request has been authorized Table Top King at its discretion may ask the customer to discard of merchandise. Re sorry, but we don? You may return a product within 30 days of receiving your item. At tabletopking, we are committed to providing our customers with the best possible on-line shopping experience. This includes a commitment to excellent customer service, even after your order has been delivered. In business for now close to twenty years, Table Top King is a large supplier of glassware, dinnerware and custom decorated items, in the United States. Proud to have been providing our customers with only top quality wholesale products at the lowest prices in the market, our goal continues to be your complete satisfaction. Event planners, major agencies and corporations, hospitality businesses such as restaurants, hotels, bars, pubs, lounges and diners, just to name a few, comprise the whole of our major consumers. We also cater to your wedding; bachelor and bachelorette favor needs, party decorations, promotional giveaways for tradeshows and conventions and much more. We also cater to all your home good needs to spice up your kitchen décor, or add fun, colorful solutions to family gatherings or a girl? You can create your own personal touch to your order. You may also like. Template by Froo Apps. The item “Globe C24HT Chefmate 24 Gas Hot Plate 100,000 BTU Restaurant Equipment” is in sale since Wednesday, July 13, 2016. This item is in the category “Business & Industrial\Restaurant & Catering\Commercial Kitchen Equipment\Cooking & Warming Equipment\Ovens & Ranges\Ranges”. The seller is “tabletopking” and is located in Elmwood Park, New Jersey. This item can be shipped worldwide.